We really enjoyed it, Great story, great acting! M.H. A MOVING AND JOYOUS THEATRICAL EXPERIENCE! T.P. Bay Theater has outdone themselves! Don’t miss Gillian! P.M.
To Gillian On Her 37th Birthday is an American play by Michael Brady. It was developed through the literary department of the Ensemble Studio Theatre and M Square Entertainment and moved to Circle-In-The-Square. In 1996, it was produced as a film by Sony Pictures and starred Peter Gallagher, Claire Danes, Kathy Baker, and Wendy Crewson. It was awarded the Oppenheimer Award for best play of 1983.
on Her 37th Birthday a powerful evening in the theatre. It questions the strength of human connection, and is quite thought-provoking. Come help provide the “Boards” for our actors to tread. All proceeds will go towards the purchase of our new stage. When two bigger-than-life personalities cross paths something interesting is bound to happen. On Oct. 28, 1940, KTSA radio in San Antonio, Texas, arranged for an on-air meeting between a 74-year-old H.G. Wells, commonly referred to as the father of science fiction, and Orson Welles, a 25-year-old stage actor that had become rather famous two years earlier when he preformed a radio adaptation of “War of the Worlds” by H.G. Wells which was originally published in 1897 in serialized form in Pearson’s Magazine in the UK and Cosmopolitan in the U.S. Although their age and career paths were quite different, one thing they shared was the gift of understatement. Presented here are quotes from both men. See if you can guess who said what. The answers are below. I don’t say we all ought to misbehave, but we ought to look as if we could. Living in the lap of luxury isn’t bad except that you never know when luxury is going to stand up. If I ever own a restaurant, I will never allow the waiters to ask if the diners like their dishes. Particularly when they’re talking. The uglier a man’s legs are, the better he plays golf – it’s almost a law. Some people bear three kinds of trouble – the ones they’ve had, the ones they have, and the ones they expect to have. Only very intelligent people don’t wish they were in politics, and I’m dumb enough to want to be in there. See “War of the Worlds: The Panic Broadcast” by Joe Landry and experience a bit of history for yourself. Tickets available at baytheater.yapsody.com or by calling 440-847-8494. Performances are at 8:00 p.m. Fridays and Saturdays, Oct. 19, 20, 26 and 27. A single matinee performance is scheduled for 3:00 p.m. Sunday, Oct. 28. General admission tickets are $12 for adults; $10 for seniors and students. War of the World T-Shirts! 2018 marks the 80th anniversary of Orson Welles’s radio adaptation of the classic sci-fi novel The War of the Worlds, which listeners took for actual news. This fall Bay Theater is producing “War of the Worlds: The Panic Broadcast” by Joe Landry. You can help promote our show and look great at the same time with one of our War of the Worlds T-Shirts available from MoArt Designs on Facebook. There are 3 basic designs to choose from and available in a variety of colors. Click on a picture to see the shirts up close at the MoArt Designs shop. Below is a link to the grant proposal that describes in depth our “Taking Theater To The Next Level” Fundraising Campaign. A special thanks to The Bay Village Foundation for funding Phase 1 of the project. Come see what we’ve purchased have so far in our fall production of “War of the Worlds: The Panic Broadcast” by Joe Landry. click the DONATE button on the right side of this page. It’s definitely time to update our website! We have been quite busy in the past few months and, as you will see, will continue to be very busy in the months to come. 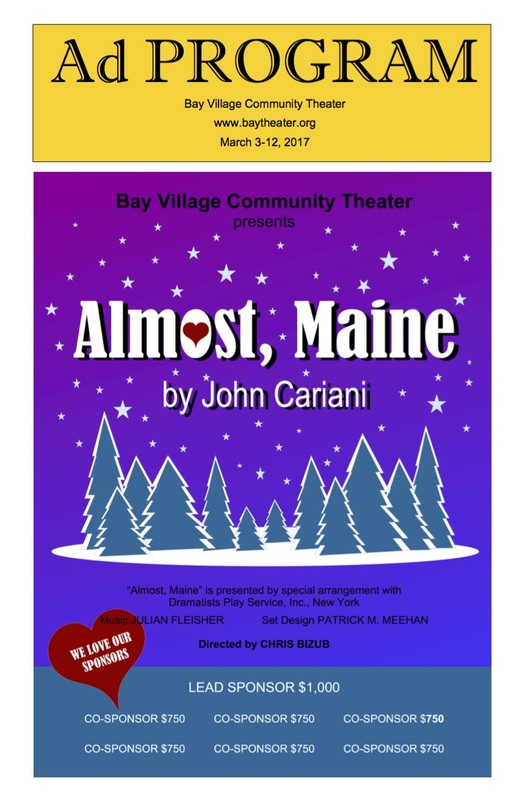 Following the initial success of our inaugural production of Almost, Maine in March, 2017, Bay Village Community Theater is proud to announce its second production. The Dining Room by A.R. Gurney will be performed at St. Barnabas’ Parish Hall for five performances running two weekends, opening on Friday, September 22 and closing on Sunday, October 1. Friday and Saturday performances will begin at 8 PM; the Sunday matinee on October 1 will begin at 3 PM. Tickets are $12; seniors (60+) and students (up to age 18) will get a $2 discount. The play is set in the dining room of a typical well-to-do household, the place where the family assembled daily for breakfast and dinner and for any and all special occasions. The action is comprised of a mosaic of interrelated scenes – some funny, some touching, some rueful – which taken together, create an in-depth portrait of a vanishing species: the upper-middle-class WASP. A brilliantly conceived and richly humorous theatrical tour de force in which six (or more) performers portray a wide array of diverse characters as they delineate the dying lifestyle of wealthy WASPdom and the now neglected room which was once a vital center of family life. For further information, please consult our Facebook page, Bay Village Community Theater. Also watch for updates on our website. BVCT’s “All the World’s a Stage[d Reading]” Series continues in July. After successful performances in March (Murphy’s Wedding, by local playwright Greg Lavelle) and June (The Twelve Pound Look by J.M. Barrie), we can now announce the remainder of the Staged Reading Series for 2017. Based on the famous Scopes Monkey Trial, Inherit the Wind is a riveting battle between lawyers Drummond and Brady with the right to teach evolution in schools hanging in the balance. December: Charles Dickens’ A Christmas Carol adapted and directed by Preston Postle. Performances to be announced. Join us for these readings. It is truly theater for the ear. Free admission!! BVCT is teaming up with Clague Playhouse on a Joint Fundraiser on Saturday, October 22! Clague Playhouse is bringing back the popular “2 Mediums at Large”. There will be an afternoon and an evening performance that day. Tickets will be $25 with proceeds to be split between BVCT and Clague. Come out and be entertained by 2 Mediums at Large. Tickets will soon be available on the Clague Playhouse website. WILL GROVER’S MILL COME TO BAY? We are looking into doing a staged reading/play using the radio script broadcast of The War of the Worlds. That’s right, it’s the story that spread panic through the radio listeners of the 1938 Halloween episode of The Mercury Theatre on the Air and cemented Orson Welles’ place in history. We are in negotiations for a possible two location event for two weekends, either in late October or early November (in keeping with the timeliness of the radio version of the story. Keep a lookout on this website or on our Facebook page for future developments on this project! Discount tickets for “Almost, Maine” available now through January 31. Save $2 off each Adult ticket. 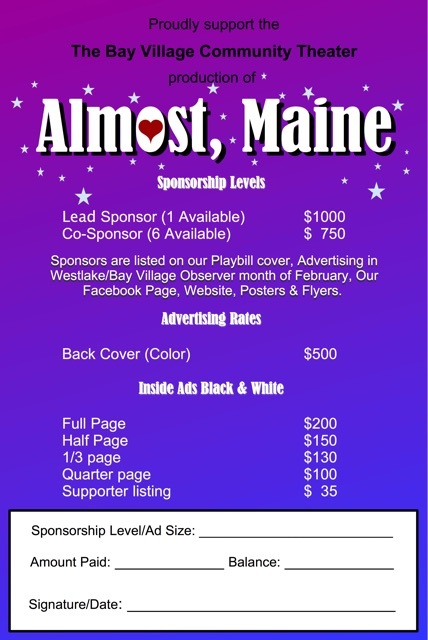 Chosen as the first full production of the Bay Village Community Theater, Almost, Maine offers a lot for our organization to be excited about. It consistently sells out and in 2014 was the most-produced play in North American High Schools for the third time in the last five years. Welcome to Almost, Maine. A town that’s so far north, it’s almost not in the United States—it’s almost in Canada. And it almost doesn’t exist. You can help our production by making a tax deductible donation, purchasing an ad in our program or by becoming a sponsor of the show. Reading Series Holiday Show, and Auditions for Our First Full-Length Production! FREE Tickets for Bay Village Community Theater’s presentation of “A Child’s Christmas in Wales” by Dylan Thomas & “A Christmas Memory” by Truman Capote in their “All the World’s A Stage[d] Reading” Series performed at Mojo’s Coffee & More. 600 Dover Center Road. Bay Village, OH 44140. Sunday December 11 at 5:00pm. Click the button below to get your tickets! Bay Village Community Theater auditions for our first full length show. “ALMOST, MAINE” by John Cariani will be Directed by Chris Bizub. It’s a story about a town that’s so far north, it’s almost not in the United States—it’s almost in Canada. And it almost doesn’t exist. One cold, clear Friday night in the middle of winter, while the northern lights hover in the sky above, Almost’s residents find themselves falling in and out of love in the strangest ways. The production is set for March 2017. Auditions will take place at O’Neill Healthcare in the main lounge beginning at 7:30 p.m. on Sunday, Dec. 11, and Monday, Dec. 12. Performance dates March 3, 4, 10, 11 at 8pm and March 12 at 3pm. We have just finished our third production of our “All the World’s a Stage[d Reading]” series at Mojo’s Coffee. Attendance for our second show, “Trifles”, performed on July 10th saw a full capacity crowd enjoying the production. “Trifles” was written by Susan Glaspell in 1916 loosely based on accounts of a murder in Iowa. ‘Wife for a Life’ drew a large audience as well! Our third production, “A Wife for A Life” written by Eugene O’Neill in 1913 concerning two gold miners in the Arizona desert who are in love with the same woman, was performed on August 14th to a near capacity crowd. Preston Postle, Colin McCauley, Patrick Meehan, and Leigh Ann Miller Spratt gave performances that left the audience quite pleased. John Hnat directed. Bay Village Community Theater and O’Neill’s Healthcare in Bay Village have joined together to present a second location for the staged reading series. “A Wife for A Life” will be performed in the Main Lobby of O’Neill’s Healthcare on Saturday August 27th at 2 PM and 6 PM. The public is invited to both performances. We are looking forward to our partnership with O’Neill’s in the coming months. It gives us the ability to put on more performances of our one-acts and helps us reach out to the community. “The Proposal”, a farce written by Anton Chekhov (1890), has been cast. Directed by Neil Donnelly the cast includes Terry Smith, John Hnat and Margaret Hnat. How can a marriage proposal go wrong? Come and find out! Performance dates are September 11th at 6 PM at Mojo’s Coffee and September 17th at 2 & 6 PM at O’Neill’s Healthcare. Bay Village Community Theater meets in the Large Meeting Room at the Bay Village Branch Library on Cahoon Road, typically on the last Wednesday of the month. “All the World’s a Stage[d Reading] Series off to a great start! The first audience members arrive to get coffee and a snack before the reading. There were smiles all around at our inaugural staged reading, beginning the series that will continue every second Sunday through December. We began the series with “Overruled” by George Bernard Shaw, and the laughter that filled the room during the performance proved the evening to be a great success. Come see our next reading, “Trifles” on July 10th at 5:30p.m. at Mojo’s Coffee and More in Bay Village. A tip of the hat to Mojo’s Coffee and More for allowing us to use their space for our performances. Kudos to John Hnat, Dave Hopkins, Margaret Hnat, Jenny Erbs, and Neil Donnelly for sharing their talents. See the flyer below for our future performance dates!